Peoples’ Savings and Loan Association Bank, Sidney, OH | ride. travel. live. 100 miles west of Newark is Louis Sullivan’s other Jewel Box bank in Ohio, the Peoples’ Savings and Loan Association Bank, facing the main square in downtown Sidney, OH. The building remains occupied by the bank that commissioned Sullivan to build the structure back in 1917, no small feat in these times. And unlike the Newark structure, this one is in fantastic condition, lovingly maintained inside and out. It was also one of Sullivan’s larger bank commissions, on a scale similar to his earliest bank in Owatonna, MN. 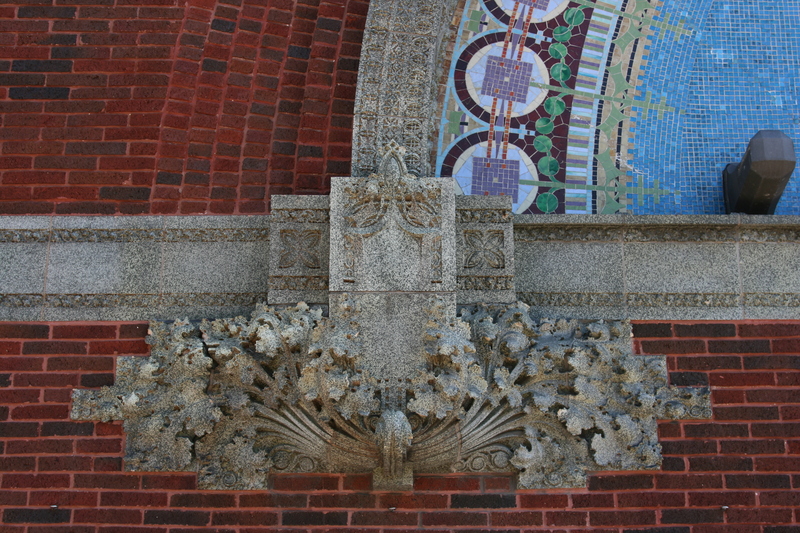 This structure has a brick exterior, with terra cotta decorative elements, and unusual for a Sullivan building, has extensive use of mosaic on the main and side facades. The mosaics utilize a more restrained, controlled palette than in Newark, green on the side, and blue on the front. 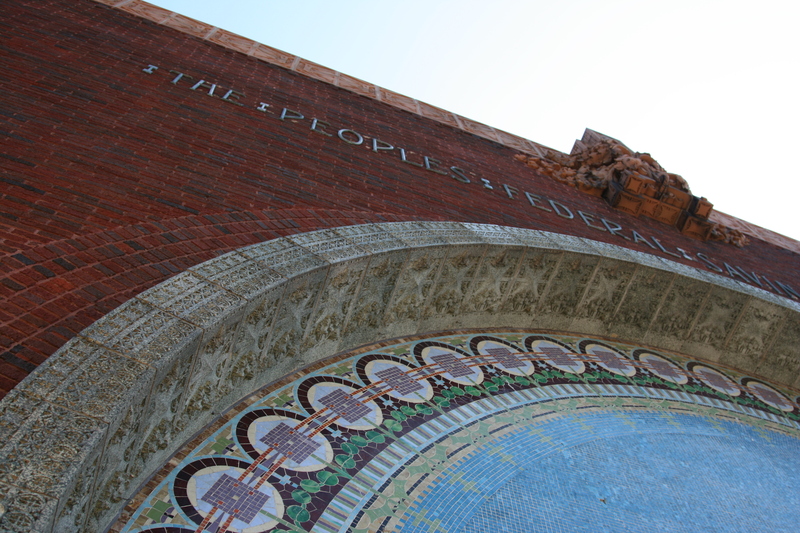 The front facade has a prominent ‘THRIFT’ spelled out in mosaic. 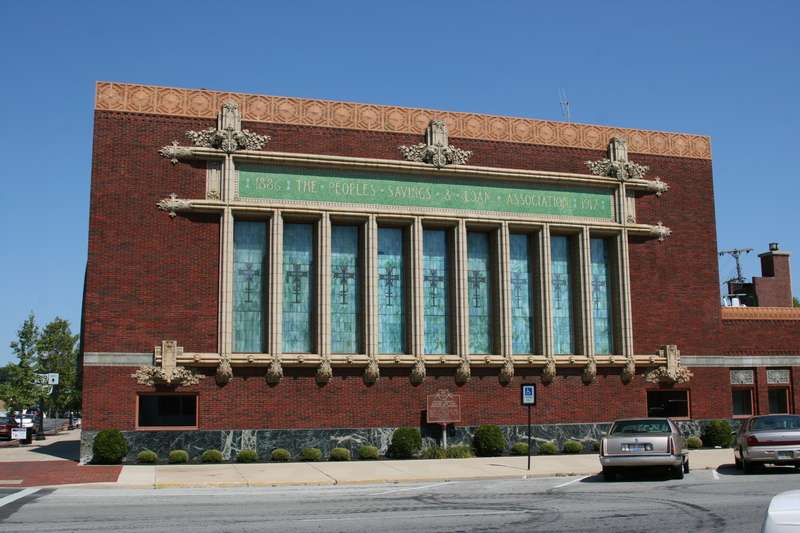 The side facade follows that of Sullivan’s banks, with a row of stained glass windows that let in ample light. 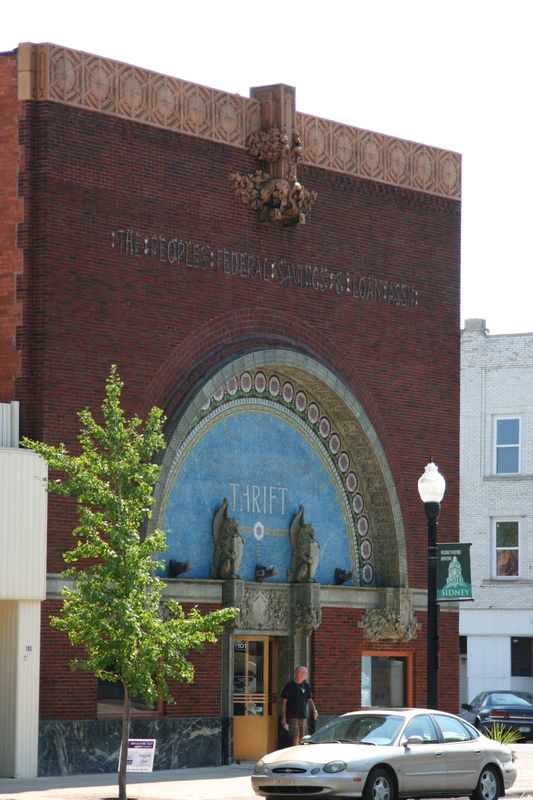 The decoration on the side facade is rich, in contrast to his Grinnell bank and lower-budget structures in Algona and West Lafayette. The interior is a successful integration of functional and decorative elements, most notably the air circulation and cooling system that is cleverly disguised in the corner metal and wood planters, as noted by Twombly and Mariscal in their book Louis Sullivan: The Poetry of Architecture. And like in Columbus, WI, the drinking fountain is a real work of art. The building is located on a prominent corner across from the courthouse / main square in Sidney, contrasting with the predominant Second Empire styled courthouse. These banks were not only places of business transactions, but they served as forums and meeting places for the citizenry, in contrast to the bank’s more transient role in a much larger city such as Chicago, and Sullivan certainly had this in mind when he designed the banks. He also consciously democratized the interior, emphasizing transparency and access. The safe is clearly visible and a balancing, symmetrical element, and offices for the bank president and other officers were easily accessible. Some of the banks even had waiting rooms where customers and citizens could interact (not in Sidney).